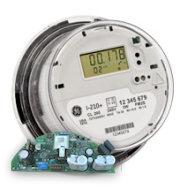 Working with equipment from major manufacturers such as GE, Vision Metering, Sensus, Badger, and others, Nexgrid's ecoNet Smart Grid Gateway provides the best self-organizing wireless mesh networks for electricity, water, and gas metering applications and are based on standards-based communication protocols. intelaMeter solutions are perfect for electric utility companies commercial and industrial as well as residential AMI/AMR applications. ecoNet's real time communication allows utilities to perform advanced metering, outage and restoration detection, demand response, and other mission critical applications that utilize a standards-based platform. Through the Nexgrid intelaHome portal consumers can access real time information of their energy usage and history through the web, mobile phone, or an ecoStat in-home display.